Burhanuddin Rabbani, head of the council charged with talking to the Taliban, was killed by a bomb hidden in a turban. The Taliban slaughtered one of their own leaders, who was used as a "peace negotiator". 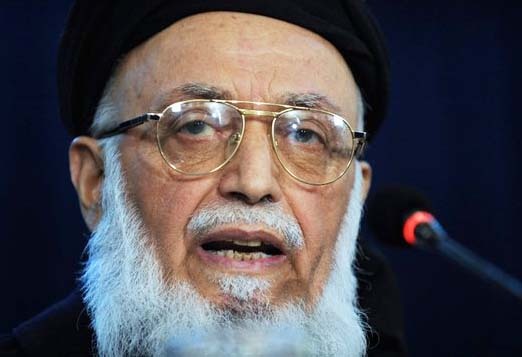 Hundreds of Afghans have gathered in Kabul to mourn High Peace Council chief Burhanuddin Rabbani and protest at his killing by a suicide bomber on Tuesday. 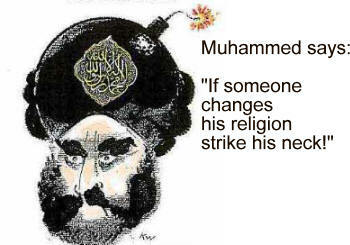 A Muhammad cartoon with a bomb in the turban of the false prophet. Kabul was gridlocked as streets were sealed off around Rabbani’s home. His ex-colleagues arrived to pay respects. Rabbani, head of the council charged with talking to the Taliban, was killed by a bomb hidden in a turban. Its amazing, that the Taliban killed one of their own, by using the example of the Danish Muhammad cartoonists. Thats is not only evil in the name of “allah”. It is also extremely wicked. Like the arab self-styled prophets Muhammad was a wicked man him self. Writing in the Koran that Muslims must cripple and kill the “infidels”.